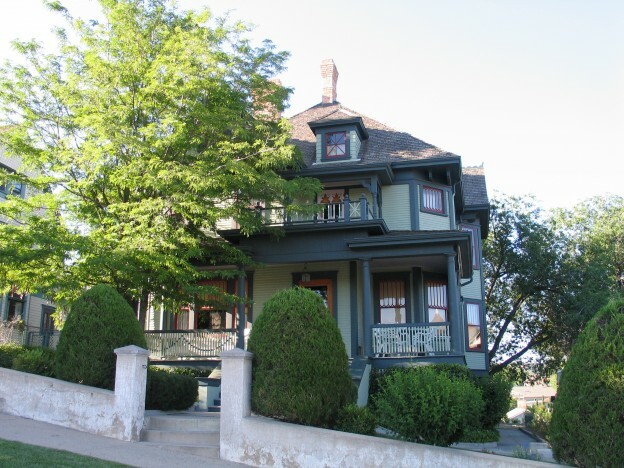 Our Prescott Victorian was built in 1898 and completely restored in the late 1980’s. It truly is magnificent ! It is beautiful on the inside and out. There are many original items in the house from furniture, and antiques to claw foot bath tubs and hot water heated original radiators. The parlor has not changed and includes a fireplace and originally restored Queen Ann furniture. The home has 3 bedrooms up stairs and a third floor with a brand new queen sofa sleeper pull out couch and an iron full bed and the best views of the Prescott skyline. We just added 3 new custom iron beds to second story bedrooms. One is a cal king and the other two are queen beds with brand new mattresses and bedding. There is one bathroom downstairs off the kitchen and 2 bathrooms on the second floor each with claw foot bath tubs and showers. The third floor has a modern bathroom with a shower. The kitchen is updated and stocked and includes a Wolf 6 burner range with double oven and an original hand made copper sink. There is artwork and paintings by famous Cowboy Artist and previous owner John Coleman who also resides in Prescott. The home is very comfortable and elegant and perfect for a relaxing stay with family as well as a very romantic getaway. The views from the porch are breath taking of downtown Prescott and the skyline. The sun sets right off the porch and the Prescott downtown square is only a few hundred yards away and less than a 5 minute walk. The house is excellent for all groups from a romantic couple get away to a large family or 2 families as it will sleep 10 comfortably utilizing the sofa sleeper.